Whether it’s a backyard barbecue or a formal dinner party, a bowl of fresh berries can be the perfect finish to most any meal. 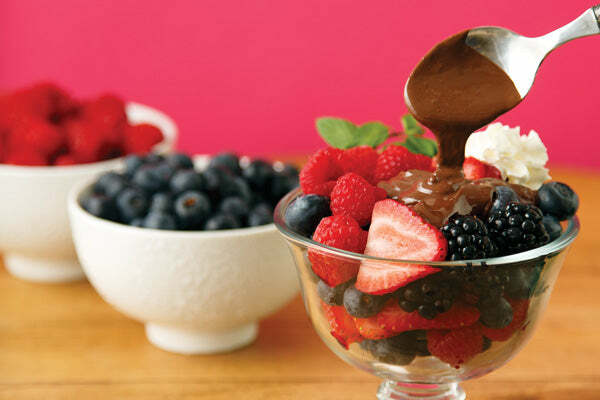 This luxurious chocolate peanut butter sauce adds an over-the-top touch to an otherwise simple dessert, and the rich, sweet chocolate peanut butter perfectly accentuates the natural tartness of the fresh berries. 1. Layer the mixed berries and sliced strawberries in 6 parfait glasses, then refrigerate as you prepare the sauce. 2. Heat the Dark Chocolate Dreams peanut butter, cream, and brown sugar in a saucepan over medium-low heat, stirring just until hot and the sugar has dissolved. Remove from the heat. 3. Drizzle the hot Dark Chocolate Dreams sauce evenly over the berries in each parfait glass and top with a dollop of whipped cream. Serve immediately. Use whichever berries are in season and look freshest at your grocery store or local farmstand. This is a terrific recipe to prepare when berry season is at its peak and the berries are on sale! 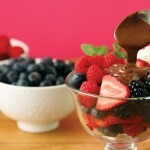 The post Dark Chocolate Dreams Sauce over Mixed Berries appeared first on - Peanut Butter & Co. Recipe Blog.